Hi, I try to compile the sources but it shows a strange errors, anyone can help me please? What compiler should I try for this: Java? Thats is DX8 missing files problem. Try the DX 8 SDK, because the error is missing DirectX 8 files, so this [ http://www.darwinbots.com/numsgil/dx81sdk_full.exe ] should help you. 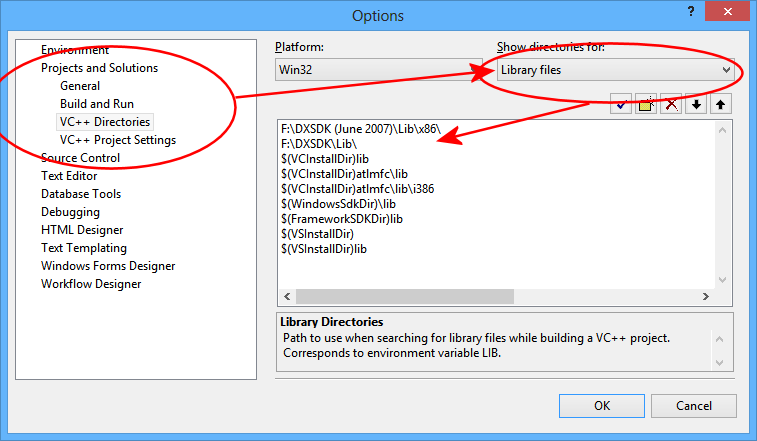 You need in the Visual Studio 2008 set the path to the header files of DX 8 SDK. Please write how to this help. Cat, please see the enclosed readme file for info on compilers. And it's C++, not Java. Mnemonic, thank you. If I use the DX 8 SDK will it overwrite my current later version DirectX files? Do I have to put it in a special place---like the compiler? I've done this before to run something but forgot what I did and whether my DirectX current version was wiped out. And you have DirectX 9 on you PC? On the computer I would like to compile on, I think so---will check tonight. Also have to check which version of Visual Studio Express I have there. I remember going through a process to link up Visual Studio Express to a new DirectX I put in but this is a few months ago so I've forgotten everything and I'm not at that computer right now. of the engine, the latter two DirectX 9 version." But I have Visual Studio 2008 Express, DirectX 9.0c 2009, DirectX SDK for DX 9 - 2009 and I have the same problem as here, maybe Mnemonic can upload his SDK here http://www.4shared.com/ and Mnemonic...You compile WME witch VS 2008 Express? DX 8 SDK may be help, but I do not have on my PC, Mnemonic...with version of SDK you have? Is it (1) "remove the "8" from all the names. There is now a generic DXGetErrorString function, which handles all DX8/DX9/DX10" ? ?which "names"?? and (3) either get an older SDK, or download the file somewhere and put it to the SDK\lib directory, or if you're up for the task, you can actually remove all DirectInput references from WME. It's not really used, I should have removed it long time ago. If one chose to remove all DirectInput references from WME, what sort of statements am I looking for? Can't compile or open anything but readme until later. But again---installing this---won't it blow away my DirectX9? If method of removing all the DirectInput references will allow me to keep DirectX9, that would be a preferred way, imho. Build log was saved at "file://c:\WMESource\src\engine_core\wme_base\Debug\BuildLog.htm"
// This file is part of Wintermute Engine. // along with Wintermute Engine. If not, see <http://www.gnu.org/licenses/>. I hope you have sorted out or can sort out your problem since this is, after all, your thread. What is this header come from? Why these errors? Any help please? Basically what happened was that I thought that the issue was with the Visual Studio Include files order (see Tools->Options->Projects and Solutions->VC++ Directories->Show directories for: Include files). Only a while later did I realize that the problem was that the project itself had some include files (see project Properties->Configuration Properties->C/C++->General) that takes precedence over the Visual Studio Include files. I also included the directshow header files in the VS Include files, but this time, since they were explicitly listed there, I could choose which order I wanted them in, i.e. that the Platform SDK had higher priority than the DirectX directories. Other than that I had to patch a few bugs with the BaseClasses source files. One was the "operator=(LONG);" issue already discussed elsewhere in this thread. In a few places there were "int"s declared in for loops that had to be declared outside the for loops. May be this helps you. But! - DONT INSTALL DX8 - YOU CAN INSTALL DX8 SDK, BUT NO DX8 (Redistributable)!!! lacosaweb: Try setting the Windows SDK version, as described here: http://forum.dead-code.org/index.php?topic=3463.msg21388#msg21388 Different SDK versions behave differently. Changing #define _WIN32_WINNT 0x0400 to #define _WIN32_WINNT 0x0500 doesn't work. If anyone can get this to work with the suggestions that have been posted in this thread, would you please post here exactly what you did? I would guess that it's possible to change the screen dimensions for the outputted game? If you can go bigger, you can go smaller? I would like to see if it's possible to get WME ported to iphone. I think it's possible but not sure how to proceed. I know it's not impossible but I'm not a professional programmer. I am just a little self-taught Cat. : ) I know Ogre 3D is porting to iphone. And I know that once you have a file that can be loaded into and tweaked in project builder on mac, you can make an iphone capable game. That is how some other game engines appear to get their games ported to iphone. You use the base game engine to create a game and then use C++ or Objective C to load it via iphone SDK into an iphone ready game. It's just an interesting thought. : ) I am far away from being able to do it but am keeping it in the back of my head as I study making a game engine for iphone. : ) The big game engines like Unity and Torque seem to take this approach imho from what I have read. At least with Torque, from what I have read, you build the game in the Torque engine, whether 2d or 3d, but then use C++ scripts to load it in the iphone sdk as you can't use Torquescript. That info could be wrong. Am only going by what I've read. It's not impossible, but it's hard. WME is programmed with C++, but it have a lot of references to DirectX and Windows environment. All these references must to be replaced by the new platform. Adapting WME to other platforms is an interesting thing specially for iPhone where the adventure games are growing popularity, but it's hard word. Chugging down Objective C at the same time. : ) The book (manuscript right now) basically teaches you how to build a game editor for iphone. It is very clear. If I can work through this and actually get things to work so I understand it, then will see if can identify what are the windows components of wme source and whether they can be replaced at all and work. It's a worthwhile project, imho, and I know it will take a long time and be hard but it it's not impossible--it's kind of interesting. So right now all I have to be able to do is read and understand the wme source code. No, it's not that simple, unfortunately. Anyone know what is the cause? Are you using the latest sources (1.8.11)? I made some changes to the sources to address some issues reported here. One of them is I removed the call to DXGetErrorString8, because the later versions of DirectX SDK don't contain the function anymore (it's replaced by generic DXGetErrorString). It would seem you're still compiling 1.8.10. Ok, I was compiling the 1.8.10 sources, thanks. Now, with 1.8.11 sources I can compile wme without errors. A wme_D3D9.exe is generated but when I try to execute it an error message is showing telling "Some essential files for the game can't be loaded. Reinstall the game and try again"
Now you need to tell the engine what game to run. In project settings in Visual Studio you need to fill startup arguments. Don't forget to enclose the project file path in quotes, especially if it contains spaces. Also you may need to copy dcscomp.dll to the same directory where wme.exe is, otherwise the engine won't be able to compile scripts (symptom - you only get a black window when you run the game). Ok, now it works in Release mode! Thanks a lot. Unable to start program 'd:\soft\wme\wme_src_1811\src\wme\DebugD3D9\wme_D3D9.exe'. This application has failed to start because the application configuration is incorrect. Review the manifest file for possible errors. Reinstalling the application may fix this problem. For more details, please see the application event log. I don't have this version of DX SDK installed. Since it complains about not knowing LPDIRECTSOUND8, didn't MS remove support for DirectSound 8 from the SDK? If so, you'll have to use an older SDK. 1>Build log was saved at "file://d:\MnemonicWME\src\wme\Debug\BuildLog.htm"
dxguid.lib is part of DirectX SDK, so your build environment is not configured properly. Please follow the instructions outlined here. I did everything according to instructions. After you install the DirectX 9 SDK, I had an error. I installed DirectX 8 SDK, now only 1 error. I did everything according to instructions. Yes, indeed, I had a mistake in the configuration. It is not the WME issue. Try to uninstall/reinstall Visual Studio Service Packs. Maybe you have used Service Pack for one of commercial editions of VS on VS EE (not absolutely sure that it is possible, but... ). Install the VS 2008 SP1 and all the subsequent updates. That worked for me (before installing SP1 I got the same error message). Hope this helps!